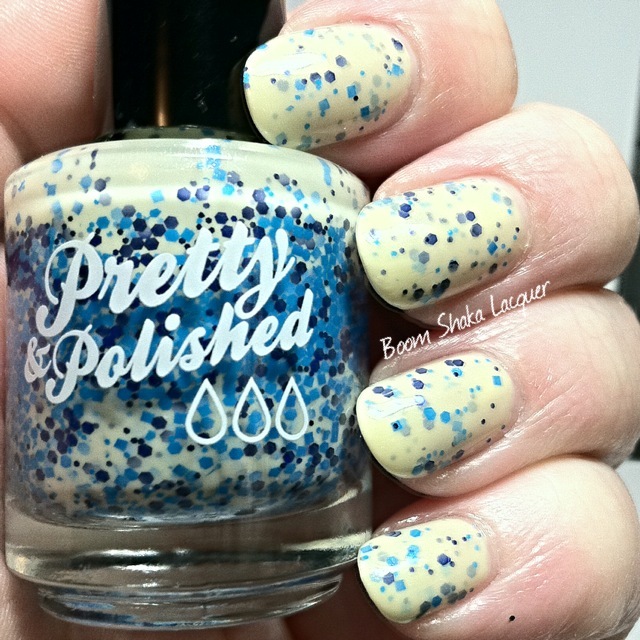 Jindie Nails – Water for Elephants! Readers! Come closer so that I can tell you about my love for Jindie Nails. 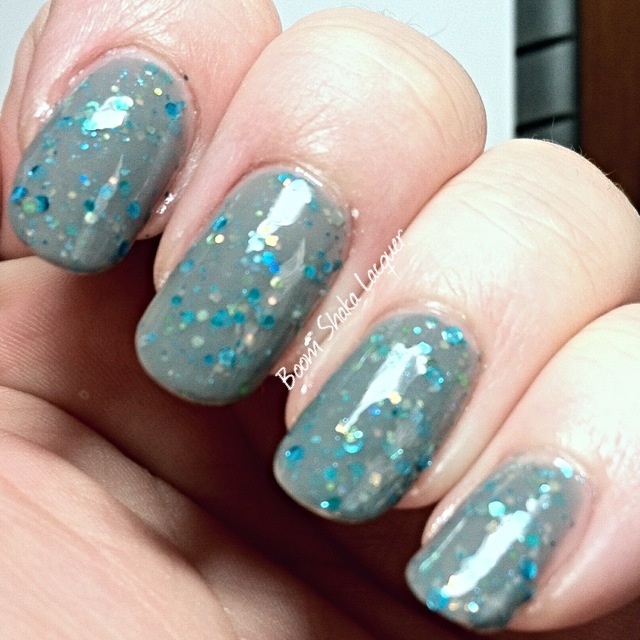 That’s right this crelly-glitter lovin’ blogger is crazy about some Jindie crelly-glitter polishes! 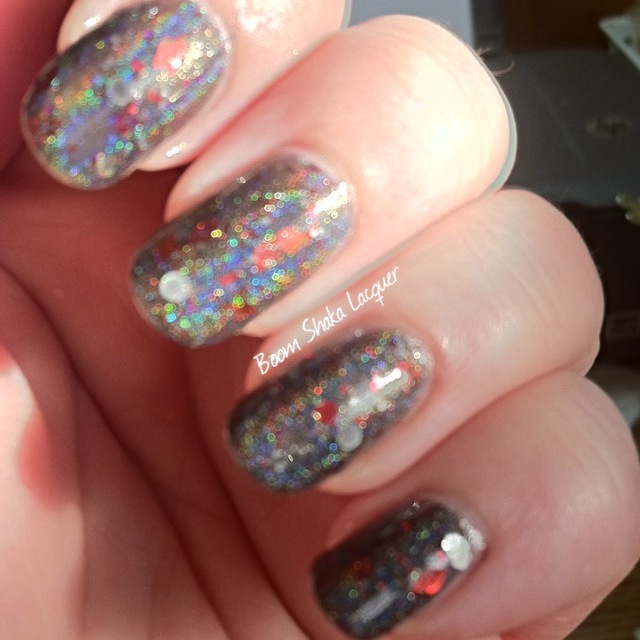 Seriously though my first experience with crelly-based glitter polishes was Jindie Nails and while I know there are others out there with excellent formulas and such I still hold Jindie Nails in a special place in my polish loving soul. I’m so excited just looking at the picture! Isn’t it BEEYOOOTEEFULL? Water for Elephants is a medium gray crelly packed full of smallish iridescent and metallic glitters in turquoise, aqua, lime green and gold. Love love love the combination of colors in this one! Application for Water for Elephants was excellent. I think that even novice polishers would have no problems with the formula on this one. I got a good amount of glitter with a nice even spread and full opacity in two coats. I didn’t have to play around with this one, sometimes crelly-based glitters, particularly if they have larger glitters, need a little patience and work to get them looking amazing. This one was quick and easy! 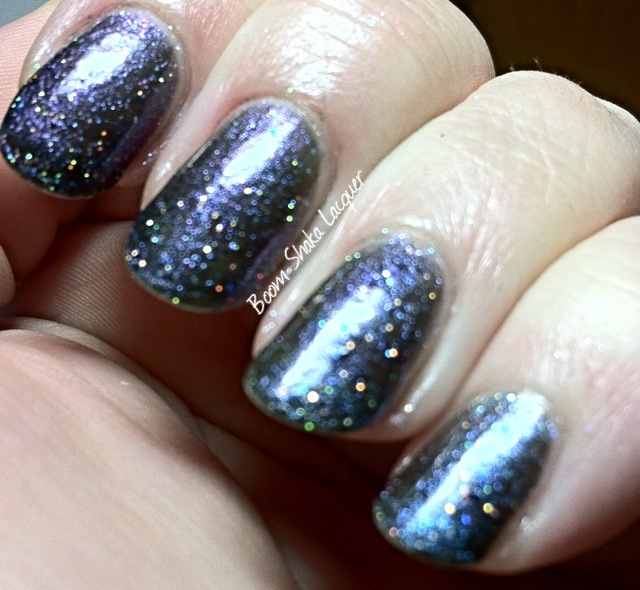 Pictures show two coats with Glitterslayer and topcoat. I hope that I’ve managed to inspire some Jindie love in you! Go on down and check out her Facebook and Instagram to see more pretty pictures and to get all the news. You can buy Jindie nails at their site as well as various stockists throughout the world. 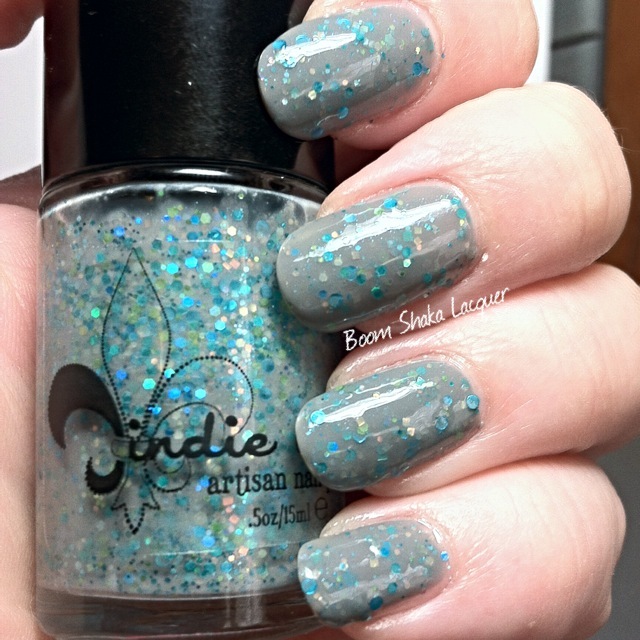 Anyone anywhere can and should get some Jindie polishes! Psst Readers! Don’t forget about the very special polish that Gothic Gala has created with proceeds towards the fundraiser for my aunt. Carolyn Beth is only going to be on sale until March 23rd, 2014! You can get your bottle here and you can read my review here. Dearest readers I’m back today with an extremely special polish to share with you all. I know that normally I’m giddy and chipper and trust me I’m giddy over this polish but I do want to talk about something else before we get to the pretty! One of my aunts has almost complete liver failure and she is in need of a liver transplant and all of the associated medical care before and after transplant surgery. This has galvanized my other aunts into doing something about raising the funds that she will need for her medical and related costs. We’ve seen our funny and feisty Carolyn Beth’s health diminish and it is heartbreaking. To help with the fundraising I started a crowdfunding profile on Crowdrise (an amazing site). You can find out more about Crowdrise here. I shared that site and the story with one of the Facebook groups I am in and not only did I get some response there but Samantha of Gothic Gala Lacquers approached me with an offer that made me cry. She offered to make a special polish with proceeds going toward my aunt’s fundraiser! I *have* that special polish to show you today! 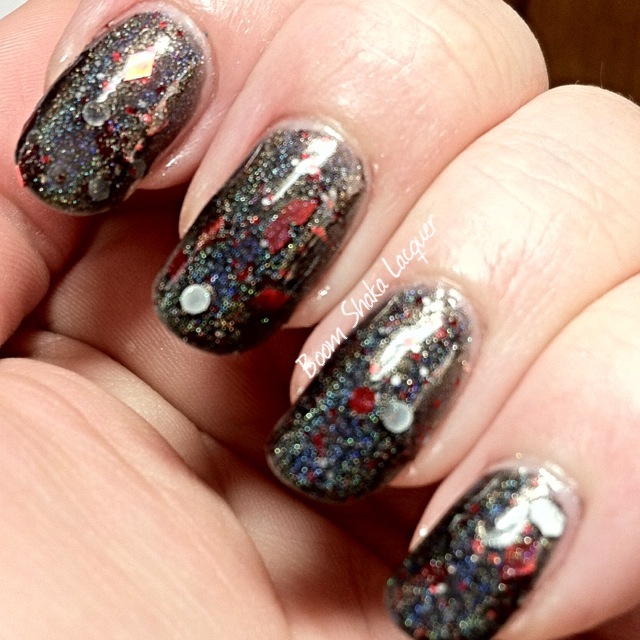 Carolyn Beth (named after my aunt, natch) is a lovely charcoal gray holographic jelly polish sprinkled throughout with red metallic diamonds, hexes, and microglitter as well as white matte dots, hexes, and microglitter. This polish really went on beautifully. I made sure to give it a good shake and let it be upside down for a few minutes before applying as there are some medium to larger glitters and I like to make sure they migrate to the top. I didn’t have to do any fishing and dabbing though and I was able to get a nice spread of glitter on my nails with some very minor manipulation once on the nail. This is a jelly base but it’s opaque in two coats. So basically this is every single thing I love about nail polish…jelly and squishy: check! Holo: check! Glitter: check! This picture I included to show you the gorgeous holo that is in this polish, a sneaky little sunbeam peeked out to allow me to capture it’s loveliness! Pictures show two coats plus a smoothing top coat mostly out of habit as it was actually not as bumpy as some glitter polishes that have shaped or larger glitters can be, I probably could have gotten away with two coats of HK Girl. You should definitely check out Gothic Gala Lacquers and go and snag your own bottle of Carolyn Beth (and a bunch of other awesome polish, omg a Doctor Who line?) in her Etsy Shop. Here is the listing for Carolyn Beth! Also be sure to follow her on Facebook and Instagram to keep up to date on all the news and happenings! If you’d like to help our family reach or exceed our fundraising goal you can visit our Crowdrise Fundraiser to donate. New Polish from Alchemy Lacquers! Greetings and Salutations! I come bearing pictures of a NEW Alchemy Lacquers Shade! As you may know I am a Lab Assistant for Alchemy Lacquers. I love it that I get to try out several different polishes that are in various stages of development it’s tons of fun! Elixir No. 3 is a charcoal gray jelly with a blue to purple iridescent shift. Oh yeah and it’s filled with holographic sparkle glitters! It’s so pretty! Here you can see the sort of icy blue shine that it has! Here you can see a little more of the blue to purple shift! As I expected with Alchemy Lacquers I’m delighted with the formula on this polish. It is a bit sheer but this is two coats with no undies! I really love Alchemy Lacquers and I really hope that a lot of people go and check out this up and coming indie brand! You can visit their site, Facebook, or Instagram to get all the gossip. Don’t forget to go get your bottle of Elixir No. 3 (or any other of their amazing polishes) at their Etsy Store. Lovely readers! I have some exciting polishes to show you. I’m excited because they are so lovely and springy and I am SO READY for warmer weather. I have never in all of my *coughclearsthroatmumblecough* years have seen so much ice and snow and winter weather in South Carolina…seriously. To add to my excitement Pretty and Polished sent me two of their polishes from their Country Girl Swag collection! I am SO a country girl. I live in a town with a population of less than 900…no stoplight…no grocery store. Yup, I’m a country girl! Barefoot in Dixie is a lovely spring green crelly based glitter polish. There are pink, purple, and green hex glitters in varying sizes. This color SO reminds me of Easter grass and Easter eggs and just puts me right in the mood for Spring, well whatever it is we call the day between winter and summer around here! Application was really stellar. I have a lot of experience at this point with crelly based glitter polishes (since they are my FAVORITE) and I had no problems with this one at all. I didn’t have to dab or fish and the glitter spread very nicely without a lot of manipulation! Isn’t she lovely? I definitely now want a little blonde puppy, I want to call her Sugar and dress her in little doggie sundresses! Wait…was that too much information? Also, yes I am the kind of person that would dress her little lapdog…well when she lets me. My puppy won’t let me put her in clothes…she protests mightily. Oh yes nail polish…sorry you just have to knock me back in line now and then! 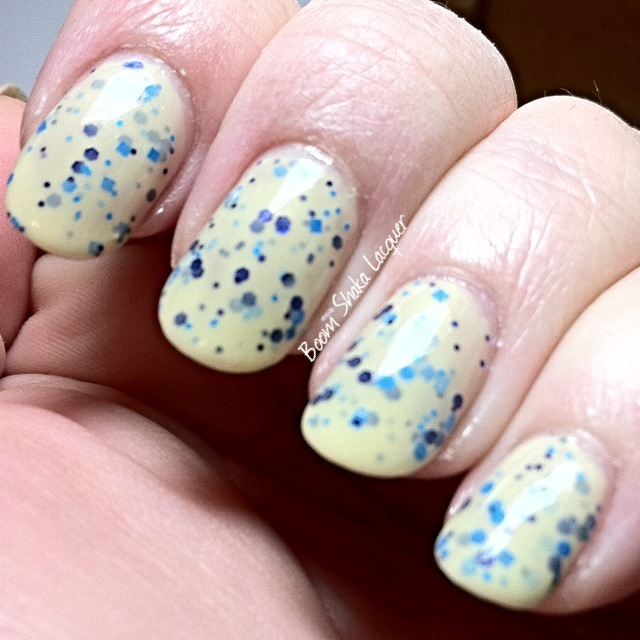 This is a lovely pale pale pale yellow shimmery crelly base filled with blue and purple glitters. I had the same wonderful application with this polish as I did Barefoot in Dixie. Both manis were two coats with no undies! They did need a glitter smoothing topcoat but that really wasn’t an issue. I already keep that kind of thing on hand as a matter of course…you know because I’m the glitter gal! I also wore this polish as accent for a full week and let me tell you it wore like iron. Super pleased with the formula on these polishes! Let me wrap up by saying that Pretty and Polished has just started a new Beauty Box subscription. I am like…kermit-arms excited about it and unfortunately I hadn’t gotten my paycheck so I wasn’t able to sign up for the first month it sold out quickly…so as soon as I can I’m signing up for the 3 month subscription and I definitely recommend checking it out as these boxes are going to have 2 Full sized exclusive Pretty and Polished polishes, a mini polish from the current line up, and other fun goodies! You can find out everything you want to know about Pretty and Polished and buy their polishes on their website, don’t forget to sign up for the newsletter! They are also on Facebook and Instagram, I’m sure they’d love for you to come and say hi to them there!